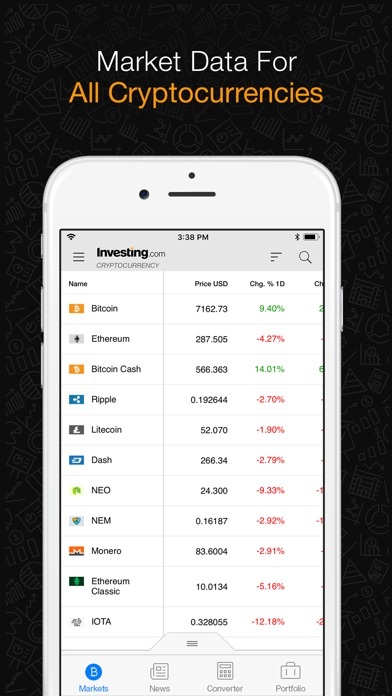 Investing.com offers an overview of cryptocurrency markets, ideal for tracking prices and exchange rates. * Real-Time and historical price data tracking for a variety of digital assets * Quotes for more than 1300 altcoins and fiat currencies * Market capitalization per altcoin * Market dominance * Trading volume * Percentage change in price for 1D, 7D NEWS & ANALYSIS Stay up to date with the latest Bitcoin and altcoin news and analysis from the following sources: Investing.com, CoinDesk, NewsWire, Bitcoin Magazine, The Merkle, CryptoPotato, CryptoCoins News, Blockchain.com Blog, Bitcoinist, Altcoin Today, Coin Telegraph, Yahoo, Reuters. PORTFOLIO Easily monitor all your blockchain assets and holdings, along with real-time detailed information on each coin. Track the total profit & loss in last 24 hours. Our portfolio allows you to identify trends, changes and opportunities for trading, based on live and historical data. 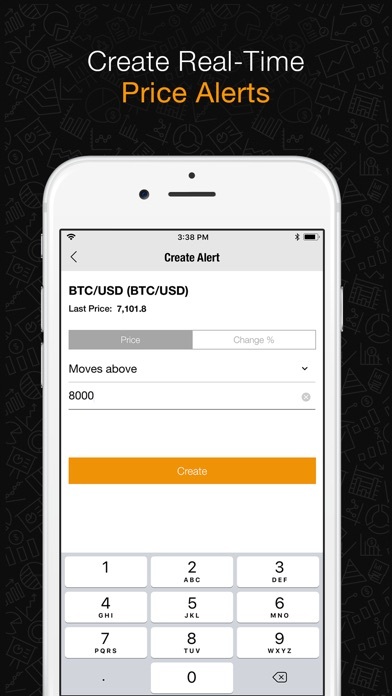 ALERTS AND PRICE NOTIFICATIONS Use alerts to immediately get notified when the price crosses a certain threshold. Set customized price alerts for your selected economic events. Keep track of significant price changes for your virtual currencies and digital assets. CURRENCY CONVERTER Compare actual crypto currencies market prices with all world fiat money and against other cryptocurrencies. 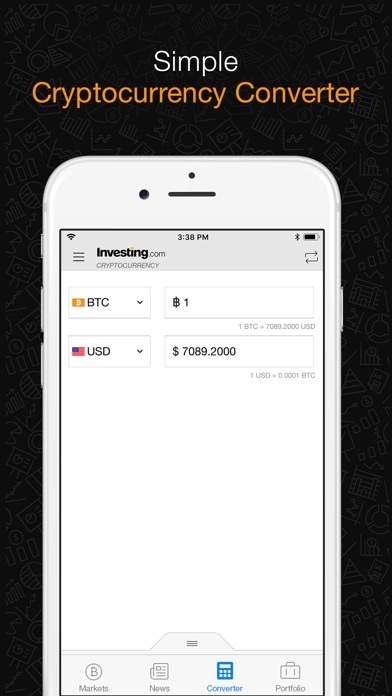 Our exchange rate data, tools and calculator offer the latest and most accurate cryptocurrency prices. 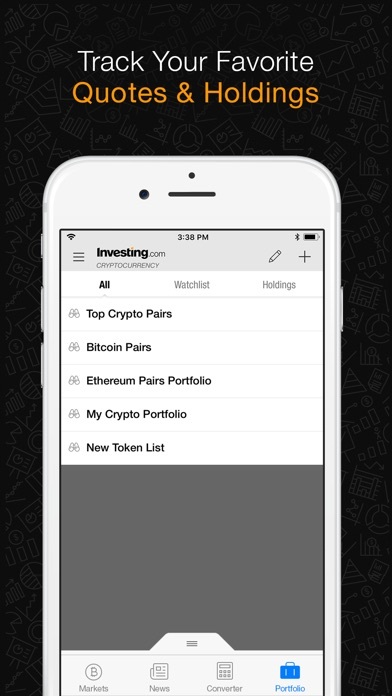 The Investing.com crypto app currently offers data from the following exchanges: ANX, BTC Indonesia, BTCC, BTCTurk, BitBay, BitStamp, Bitfinex, Bithumb, Bittrex, CHBTC, FoxBit, GDAX, Huobi, Kraken, MercadoBitcoin, OKCoin, Poloniex, itBit, xBTCe, Yunbi, Coinone, Binance, HitBTC, Exmo. 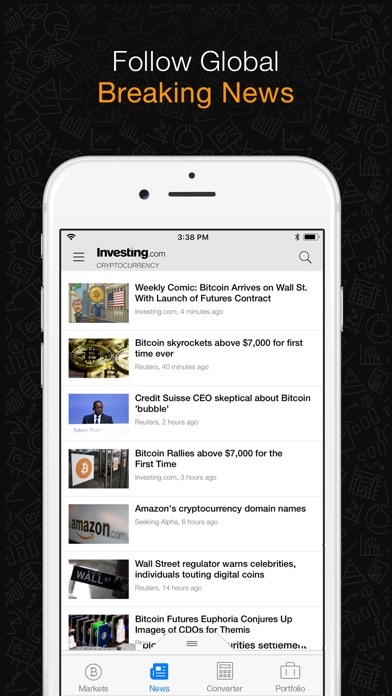 Investing.com Provides Data for More Than 1300 Coins! Top supported cryptocurrencies: Bitcoin (BTC), Ethereum (ETH), Bitcoin Cash (BCH), Tether (USDT), NEO, Qtum, Litecoin (LTC), Cardano (ADA), Ripple, (XRP), Zcash (ZEC), Ethereum Classic (ETC), OmiseGO (OMG), Monero (XMR), Dash, Walton (WTC), Hshare (HSR), DigiByte (DGB), Binance Coin (BNB), SALT, Lisk (LSK), AdEx (ADX), IOTA (MIOTA), Stratis (STRAT), Kyber Network (KNC), EOS, AdEx (ADX), ChainLink (LINK), BitConnect, (BCC), Waves, InfChain (INF), BitShares (BTS), Verge (XVG), Regalcoin (REC), Aeon, FirstBlood (1ST), Monaco (MCO), NEM (XEM), Dogecoin (DOGE), Bitcoin Gold (BTG), Stellar (XLM), TRON (TRX), Populous (PPT). 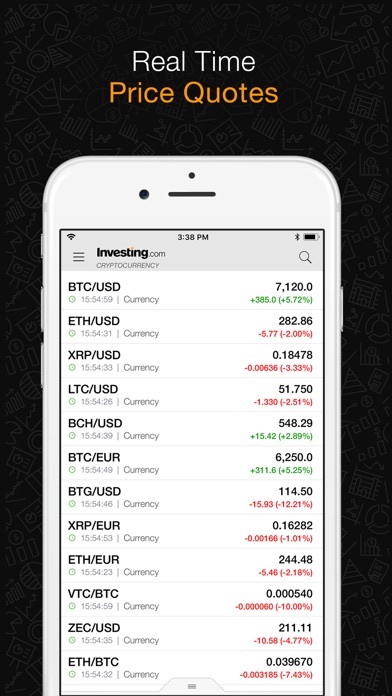 CHARTS Our professional real-time cryptocurrency chart allows an in depth look at hundreds of virtual currencies. Easily track realtime and historical prices across the chart's timeline. You can customize the appearance of the chart by varying the time scale, zooming into different sections and adding new studies or technical analysis indicators. DARK THEME / NIGHT MODE Easily switch to Night Mode with our dark theme. You can minimize eye strain and reduce the blue light emitted by your smartphone screen. This is a good site especially for up to minute information and numbers. 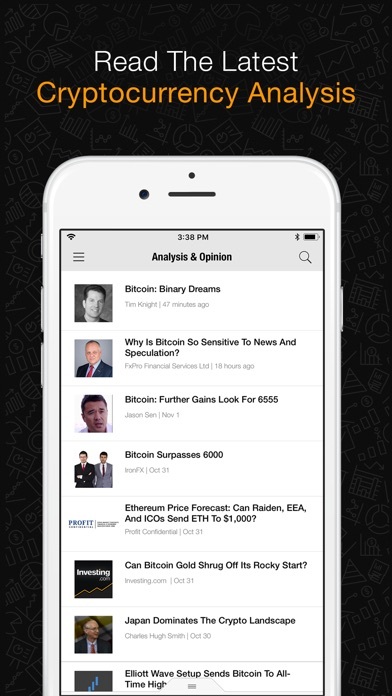 This App is what anyone who invest in Crypto currencies need to have all the data an news in the palm of your hands at your convenience, from helping to watch a position or your portfolio to watch for the perfect time to buy or sell the market ( of course on your brokers platform) while you are on the go this app will definitely provide you with what you need to stay informed. The ads spoil any positive experience I might have, and there is no way to get rid of them.